Photo: George Salisbury / Warner Bros. It says a lot about the general weirdness of the Flaming Lips that when they make a concept album featuring narration by Mick Jones of the Clash, it barely registers a blip on the "odd" scale. Surely, King's Mouth: Music and Songs is a delightfully strange album, but this is a band that made an experimental four-disc set meant to play simultaneously on four CD players (the ambitious, if slightly flawed Zaireeka), a Dark Side of the Moon tribute album, and have cultivated a difficult-to-explain relationship with pop singer Miley Cyrus. The Flaming Lips rarely do anything by the book. 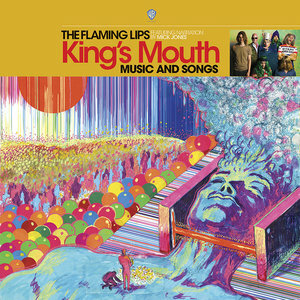 Having said that, King's Mouth – released in limited (4,000 copies) gold vinyl for Record Store Day, with a general release in July – is pretty standard Flaming Lips fare. The usual sonic structure is in place: belching analog synths, strumming acoustic guitars, frontman Wayne Coyne's off-key crooning. If anything, the album comes off as a more low-key version of their standard sound. An interesting wrinkle with this particular album is that it parallels Coyne's immersive art installation of the same name, showcased in museums in New Mexico, Oregon, Maryland, and the band's home state of Oklahoma. Perhaps the airier, less abrasive sound on King's Mouth is the result of Coyne attempting a more inclusive piece of art. "The King's Mouth immersive/childlike qualities are born from the same spark and womb as the Flaming Lips live performances," he explains in the press release, adding that it "was made for humans of all sizes, ages, cultures, and religions". Not that this is a standard, radio-friendly pop album. The brief opener, "We Don't Know How and We Don't Know Why" is a typically swirling, psychedelic fanfare that sets the stage with the aid of Jones' recitations. "We don't know how and we don't know why," he says, "but when the king was born / His mother died / She was the queen of their hearts / And the queen of their minds / Her sisters and the nation cried and cried." And we're off. King's Mouth veers from cracked lullabies like "Giant Baby" to trippy, distorted collages like "Electric Fire" to the dark funk workout "Feedaloodum-Beedle-Dot". Jones provides the narrative glue to the album's story, but it never really overpowers the album. It's not by any means a dominant, distracting feature. He pops in every once in a while to provide updates in an innocent, children's book cadence, navigating through the trippy twists and turns with the music providing appropriate dramatic flair. Their first album since 2017's somewhat polarizing Oczy Moldy, King's Mouth seems perfectly happy to tread stylistic water, acting almost like a default Lips album, despite (or perhaps because of) the thematic ambitions at work. The band also manages to once again pull the wool over the eyes of any listener who insists that the band is all style and no substance. Buried underneath the idiosyncrasies of "How Many Times", for instance, is a gorgeous, tender pop song. The band is often dismissed as a cabal of weirdos, but they know how to coax a great hook out from under the layers of aural goop. It almost seems beside the point to follow the story of King's Mouth. The dreamlike, sci-fi fantasy is fun to explore, but there's too much great music locked in the grooves that shouldn't be dismissed in favor of overanalyzing the subject matter. When the album closes with "How Can a Head", the cinematic flourishes signal not only a great story's final chapter but also the end of another mysterious, otherworldly entry in the Flaming Lips discography. The "King" may be dead, but the band lives on.